In the heart of Ocho Rios located on the Caribbean Sea is a self catering, split level one bedroom apt, king size bed, air conditioned with fulll bathroom and toilet downstairs. Separate living and dining areas, fully equipped kitchen, white sand beach, and water sport facilities easily available. Walking distance to centre of town, shops, banks and restaurants. Maid service. Linens provided, wireless internet, hair dryer,Cable TV, microwave and other comforts of home. 24 hour security. Amazing snorkeling! Local attractions: Within a five mile radius you can easily visit the famous Dunn's River Falls, Dolphin Cove, Mystic Mountain for Bobsled ride and chair lift, horse back riding, Plantation Tour and two Botanical Gardens. Water sports available on your door step and some awesome snorkeling! Within walking distance to town, easy access to famous attractions...right on the ocean front and centrally located. Walk to shops, clean, fresh looking and centrally located. Best snorkeling right on your door step. All linens provided and hair dryer. Private airport transfers available upon request. Avid Car rental available in Ocho Rios. Car and driver can also be arranged to take you on your sight seeing expeditions. 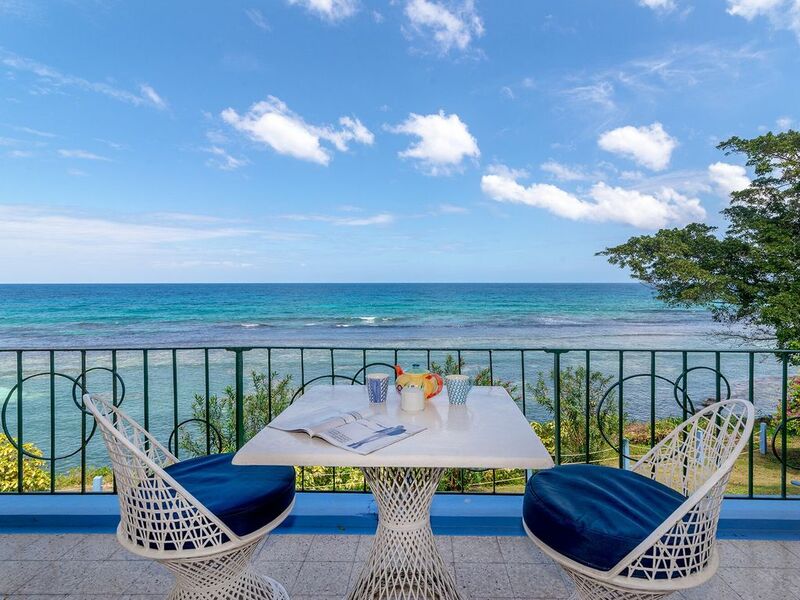 Ten minutes away from the famous Dunn's River Falls, Dolphin Park, the famous Jimmy Buffett's Margaritaville Bar, botanical gardens and numerous other attractions. Ariel chair lift to Mystic Mountain and Bobsled ride ... Walking distance to restaurants and shopping areas including duty free. Unit is situated right on the ocean with great views. Building/condo was probably built in the 60’s. Grounds are well kept. Host was very pleasant and responsive. The condo unit is in need of updating. Wicker indoor furniture is equivalent to outdoor patio furniture with bad couches. All couches need replacing. Wicker is getting moldy and needs cleaning. King size bed is nice but is hard as a rock. Needs to be replaced. Old galley kitchen is small and needs drawer repairs. Air conditioning is located only in the upstairs bedroom. On hot humid days the ocean breeze and fan is not adequate for the first floor. With having to have the first floor patio door open, the smell of pot from the neighbors smoking multiple times a day is continuous and annoying. Mahogany Beach next door is a short walk from the condo and chairs can be rented for less than $3.00/day. There is a reason for this, the majority of chairs are broken and in disrepair. Beach lacks sand, water is dirty and shallow. Best part is the tour boats that arrive with 50-100 people taking over the small beach which maybe 150 feet long. Cool Runnings tour boat runs out of this beach/cove. Not a beach you want to go to for relaxing or swimming. For taxis we utilized the security guard at the gate. He was great at getting taxis at reasonable prices. This modest condominium is a hidden gem amidst the myriad of hotels, resorts and boutique inns. The Carib condos at Ocho Rios are situated within 10 yards of the ocean, and just off the shoreline is some of the best snorkeling in the Caribbean. The unit itself is very self-contained allowing guests to cook their own meals if preferred, or walk within an easy 10-minute walk for dining out options. The condo is clean, quiet, quaintly appointed and centrally located, within a 10 minutes to the local open air market, major grocery stores and banking options. Belinda and her recommended driver Anthony are both exceptional! Incredibly genuine, helpful and gracious -- both emanating a sense of pride in Jamaica and the local culture. For those desiring a place to completely unplug, relax and rejuvenate, this is your place! Reliable internet, hot water upon demand, 24 hour security, and luxurious trade winds that drift through the building all add to the delightful, relaxing ambiance of this hidden gem. Finally, a couple who know what they want when on holiday, know how to travel and explore to the fullest! Great meeting you both, appreciate this and your wonderful memories in my guest book! You were a puff of fresh air floating through. My doors are always open & hopefully, next time will be longer & discounted! Thank you both. Most beautiful, peaceful, fun vacation ever! This condo was even more spacious and lovely than we imagined. We could make our own meals, thanks to the full kitchen, and even enjoy eating them at the table and chairs on the balcony. What a beautiful view! The surrounding grounds are picturesque and well kept, and it was a pretty walk to the beach nearby. Thank you Belinda for a lovely week, and for all the home-like additions you provided, and for answering all our questions. We booked a couple of local activities - horseback riding and bobsled - on days when there was no cruise ship in Ocho, and had a wonderful time. The driver Belinda recommended, Anthony, was very reliable and knowledgeable of the area. We enjoyed our time with him - from the airport, to our activities, and touring. Thank you Belinda! We hope to come back. Clean, cosy apartment with a home-from-home feel. Beautiful views and very comfortable. Definately recommend! Little piece of heaven in the Caribbean! We booked this accommodation based on the great recommendation of previous guests who raved about the snorkeling. They were correct! And they left great instructions on exactly where best to find them in the protected no-fishing zone along the coast. Abundant shallow water reef fish are just steps away from this apartment. We also saw a ray and two spotted eels. The property has beautiful landscaping and excellent security. It is a safe walk into town for groceries and dining. We could occasionally hear music from town, but it added to the Caribbean vibe. The property itself was extremely quiet but there was low occupancy during our stay. The unit itself shows some age but was well equipped, comfortable, and clean. The wifi was excellent, and the electricity (and hot water) worked 100% ( I noted other property reviews reported problems). We had a few tropical insect occurrences but this is to be expected with the doors and windows open most of the time, and bug spray from the unit did the job. Daily trash disposal is a good idea. Like other reviewers, we spent a lot of time on the balcony as it stayed shaded all day. The beach was frequently crowded with day trippers who left daily for a catamaran trip. The water is very shallow along the coast and there are insufficient lounge chairs for Carib Condo guests, or are in disrepair, but the staff were quick to assist us on the one day we ventured onto the busy beach. Note the restaurant/bar mostly caters to the day trippers and was closing by 5pm, but Carla reopened the kitchen and gave us good company while we waited for our good burgers. Overall, this was our most relaxing vacation and would stay here again. Thanks, Belinda! Thrilled to know the snorkeling surpassed your expectations and thank you for all your helpful tips that other renters can be aware of. Hopefully you will return again one day soon as the snorkeling awaits you! Belinda went over the top as far as hosts go and I couldn't be any happier. She immediately responded to all of my frequent questions, advise requests, and concerns and took care of them immediately. The apartment is wonderful. Bed is a bit firm but still very comfortable and well equipped. AC runs COLD and will keep you more than comfortable. The kitchen is decently well equipped and is fine for two people. Mahogany beach is right nearby and is very nice when it's not busy. One day a tour bus full of tourists came and really overwhelmed the beach but on all the other days it was perfect. We loved Ocho Rios! There was no trouble walking around during the day and we even felt comfortable making a few excursions at night to the local establishments. Soldier's restaurant had one of the best lunches around for $10 a person. We took Joe Cool Taxi roundtrip from the Sangster Airport (Montego bay) and it was quite cheap and very professional. Overall we were very happy with our stay! One thing to note is this is a tropical climate and we did encounter a few "guests" (cockroaches) in the condo. Belinda assured us they will be taking care of that asap. That would knock it down to four stars at least but Belinda's service more than made up for it. Wow...it was great having you to stay and glad you took advise so that everything worked out so well...you must be missing Soldier's by now! Look forward to your return soon. Ocho Rios is situated on Jamaica's north coast about halfway between Montego Bay and Port Antonio. Montego Bay airport approximately 1 1/2 hour drive. Carib is situated on Mahogany Beach. The area offers varied beaches and lush tropical gardens. Stunning natural beauty combined with numerous activities, shopping and dining experiences. Local attractions include, swimming with the dolphins, infamous 600' Dunn's River Water Falls, chair lift to the top of Mystic Mountain for spectacular panoramic views and bobsled ride, Konoko Gardens & Falls, plantation tours, tubing, horse back riding and near by Bob Marley's birth place. Groceries, for the client's account, can be brought in for arrival, upon request. Clean up service provided. Cook available on request for a small additional charge and she will take you to the local markets. Private driver for sight seeing excursions available upon request.